The British forces MTP 25mm strap tidy is a small loop of MTP printed 25mm webbing tape as used on the front of the MTP Osprey vest that loops together and is held fast with a press stud. The length of the loop is enough to go around one of the 25mm wide MOLLE straps or any other 25mm strap attached to the Osprey tripled over. The purpose of the strap tidy is to hold down loose ends, such as the ends of keepers or sling points. They can also be used to provide a quickly detachable point on the MOLLE base for small utilities. Made of IRR Milspec Cordura. 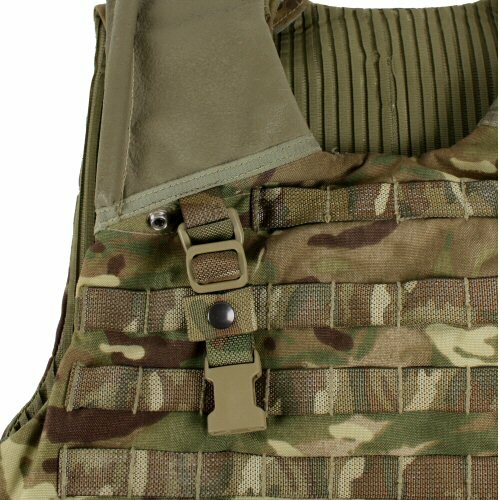 The strap tidy used to wrap around a sling point on the Osprey Mk 4 Armour vest.